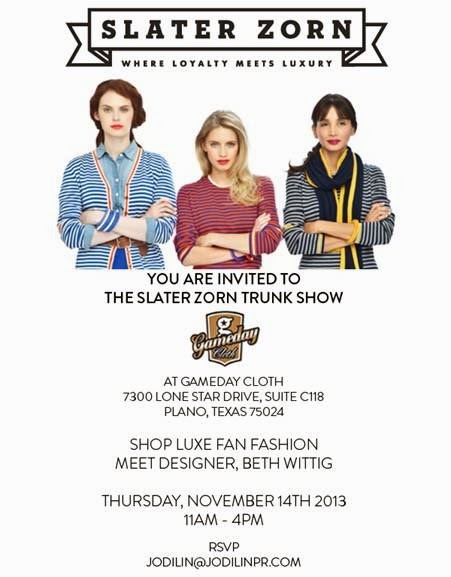 Luxe fashion line, Slater Zorn, will be staging a trunk show at Gameday Cloth on the afternoon on November 14th. Inspired by the upcoming Shootout game, Baylor v Texas Tech at AT&T Stadium, we are bringing a comprehensive collection of stadium style apparel for him and her. Patrons can come down, meet the designer, Beth Wittig, and try any of our scarves, hand warmers, hats, socks, sweaters, capes, belts jewelry and more! Slater Zorn has paid great attention to replicating authentic team colors and combinations favored on athletic fields across the US and beyond, offering a web feature allowing customers to quickly sort through the collection by garment type, by color, and better yet school. Designed to take fans from the office to the arena to the after-party in style, Slater Zorn’s garments and accessories are constructed of rich Merino wools, Scottish cashmeres and fine silks. Built predominantly in base colors and accented with stripe, houndstooth, ombre motifs and more, the collection components are carefully coordinated and constructed to mix and match with ease to a multiplicity of identities. Created by a female as passionate about fashion as she is football Slater Zorn aims to be the avant-garde of sideline apparel.